THE SKULLS OF THE ARCHAELOGICAL MUSEUM IN LIMA PERU. Ruanel: Here I am again with you. Interlocutor: Can we start directly with the questions? Ruanel: There are skulls that belong to extraterrestrial beings directly, and that can be seen by any renown archaeologist. Interlocutor: Are we speaking of aliens that have disincarnated? Interlocutor: And Is this the whole mystery? Ruanel: Correct. What happens is that there will always be detractors that say "this was prefabricated", "this is assembled." Interlocutor: Do you perceive the skulls that I am pointing out with the finger in this sheet? Interlocutor: Do all belong to the same race? Ruanel: No, there are two different races. Interlocutor: In which area were they? Were they with the Mayan, with the Aztecs? Interlocutor: What races were they? Ruanel: There was a race very similar to the human, but smaller. they would be around 1,40 m height, like the beings from Antares 4. Interlocutor: Is the small skull that I am pointing out now? Ruanel: Correct. After that there was a race of Grays, taller, but with the brain not so big like another type of Grays. The skull was very similar to the Homo sapiens but more flattened and longer. Interlocutor: And the first skull I pointed to what extraterrestrial race did it belong? Ruanel: From a not well-known star. Interlocutor: How far is that star? Ruanel: It is more or less to 550 or 600 light years, but I repeat that it doesn't appear in the astronomical charts. Interlocutor: And how could the astronomers find that star? Ruanel: Aiming the telescope toward Vega's side. Interlocutor: Could we call them somehow? Ruanel: Yes, they are Xilons. Interlocutor: And how about the Grays? Ruanel: The Grays are a race that is pretty spread in all the Galaxy. they are Morals, but I clarify that they don't have anything to do with what you call “moral” on Earth. They call like that because their star is called Moral. Interlocutor: Is it in our astronomical charts? Interlocutor: How far away is it from us? Ruanel: Approximately 600 light years, but it’s not in the same side to Vega, but toward Antares. Interlocutor: How long were these aliens here? Interlocutor: There are some skulls that don’t belong to extraterrestrials but rather they were deformed? Interlocutor: Who deformed those skulls. Interlocutor: Then not all the skulls are extraterrestrial? Ruanel: Correct, many of them were assembled. Interlocutor: Always by the natives? 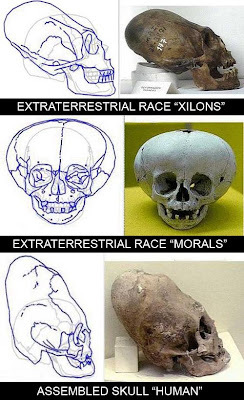 Interlocutor: Let’s see if I understand, in the Archaeological Museum of Lima there are directly extraterrestrial skulls that belong to two races that have not been modified, and skulls that are from Homo sapiens that have been deformed. Is that right? Interlocutor: Is this what has befuddled to researchers? Ruanel: Any researcher a little bit skilled has to realize that there are real skulls and skulls that are not real because they have been assembled to give them that shape. Ruanel: No, What I said is enough. I’ll make a small recess so that the vessel rests. Interlocutor: Okay, see you later Master and Thank you. This entry was posted at Thursday, August 27, 2009 and is filed under Extraterrestrials . You can follow any responses to this entry through the .